ASHE Roasters use Fluid Bed Technology and can be classified as a hot air roaster or air roaster. Fluid bed air roasting or hot air roasting is a superior form of coffee roasting that was technically not possible when legacy drum style coffee roasting systems were originally developed in the 1800’s. Not until efficient electric blowers and heating elements became commercially available, was it possible to develop a cost effective production worthy fluid bed roasting system. Modern fluid bed roasting equipment uses a stream of high velocity hot air to levitate the coffee beans and suspend them momentarily in a bath of hot air, allowing uniform heating of the individual beans. 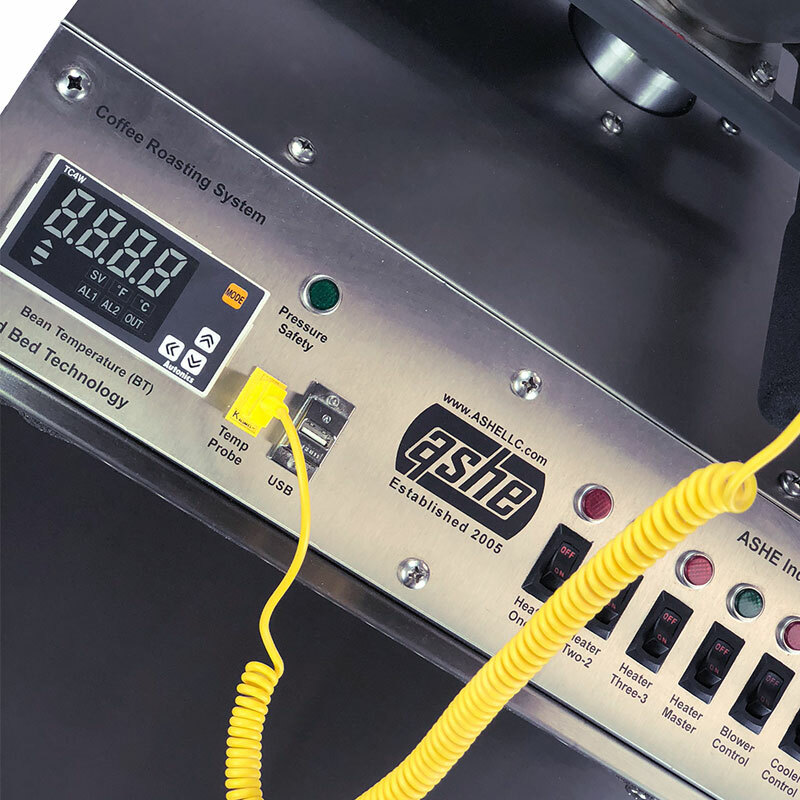 Air roasting with a purpose built ASHE hot air roasting system, designed specifically for roasting coffee, provides a consistent uniform roast batch after batch. As the coffee beans are levitated in the the hot air stream, they roll and tumble in the super heated air, which causes unwanted by-products of the roast (burnt chaff, under size or broken beans, etc) to be expelled by the convective/lifting action of the hot air. In addition, our fluid bed hot air roasters come with forced air cooling outside the roast chamber, which gives almost instantaneous cooling and allows for the next roast to be loaded in the roast chamber immediately after pouring out the fresh roasted batch into the cooling system. 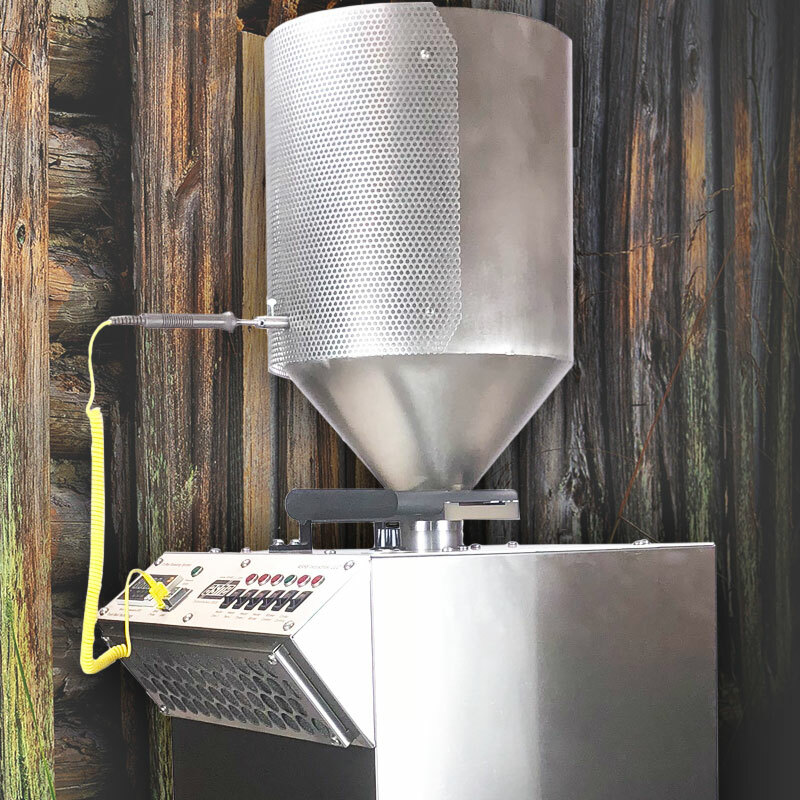 This provides for an efficient production process for high volume roasting with minimal production labor. 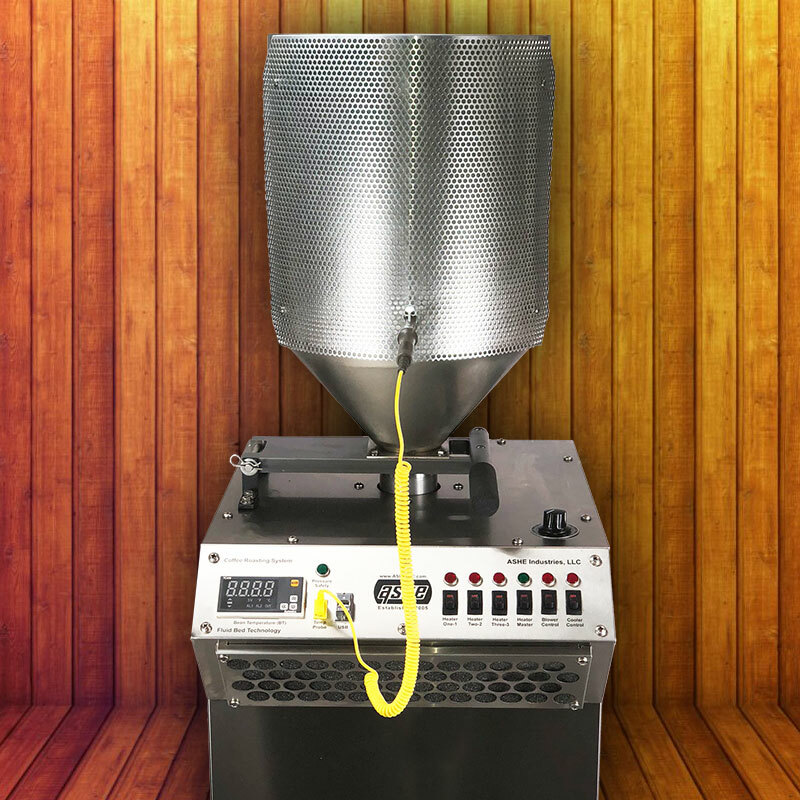 The ASHE roaster comes standard with a forced air cooling system. In most fluid bed roasters the beans are cooled in the roast chamber by means of a water spray. With the ASHE system, the beans are tipped into the cooling system as soon as the roast is completed, and cool down to a point where no further roasting is happening within seconds, and continue to cool to touchable within just a few minutes. This give the roaster the advantage that a new batch of coffee can be roasting in the roast chamber immediately after the previous one has been tipped out, allowing for continuous roasting. The cooled coffee is removed from the cooling tray long before the next batch is ready to tip. The cooled coffee can then be immediately packed to preserve freshness. The longer coffee beans are roasted, the more the flavor oils are reduced. Drum roasters can take 20 minutes to roast a 10 lb batch. ASHE coffee roasters take approximately a minute a pound to medium roast, just a minute or two longer to dark roast. 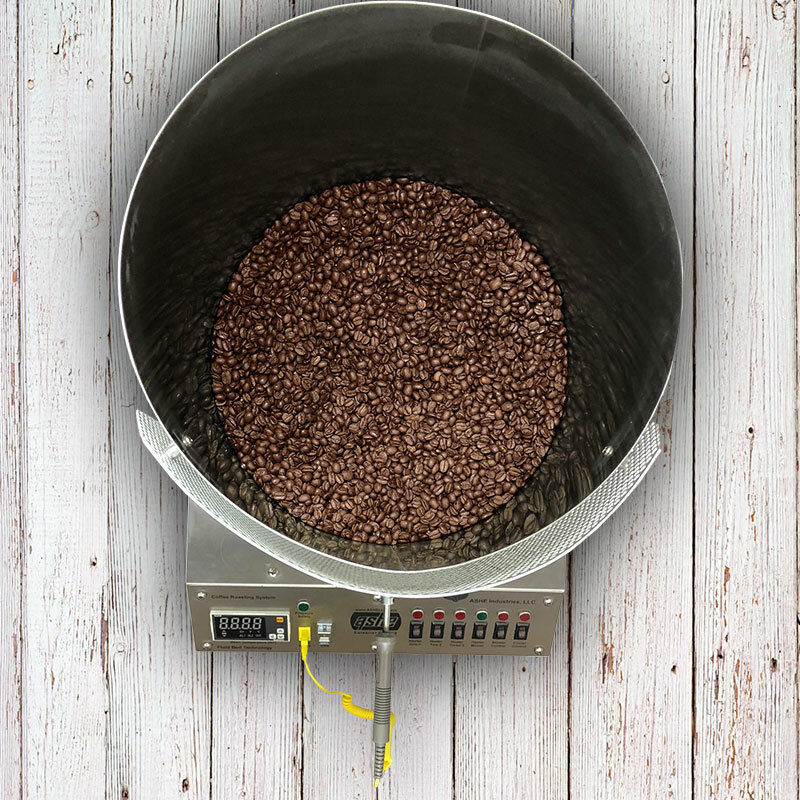 The ASHE roaster provides a consistent temperature to all the beans in a batch. Because of the “fluid” motion formed by the hot air being pumped in, the beans rotate up and down and around in the air flow in the roasting chamber constantly, so that each bean is roasted to exactly the same degree. 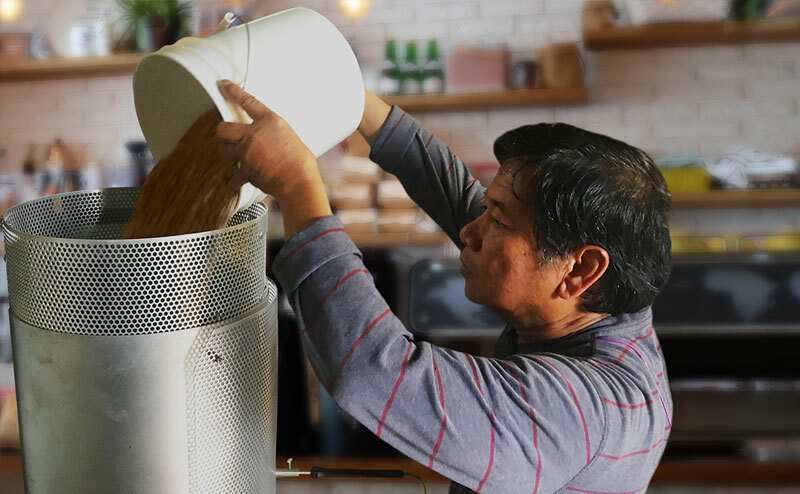 In a drum roaster, the beans are stirred with a mechanical arm which does not distribute the beans evenly in the heat, causing some beans to be over-roasted. Fluid bed roasting is much easier to control than with a drum roaster. The operator can observe the coffee at all stages, rather than pull a sample every few seconds to see where they are. Roasting can be done entirely and precisely by temperature, if desired, though most roast experts will want to use their eye, nose and ears as well, that is how one becomes a roast expert rather than just a roast operator. However that level of expertise is not necessary with a fluid bed roaster, the way it is with a drum roaster, just much more fun to do. Power Requirements: 240 volts AC, 45 amps for heaters;120 volts AC, 13 amps for blower, cooler, and controls. Sold Separately: Includes cyclone 220/240V, 8 amp 1 Phase, 2HP blower, Chaff Collector, Swivel hood assembly for mounting to roaster & flexible ducting.